My introduction to Frank Zappa came at the age of 14 or 15 with the Does Humor Belong in Music video. I remember being less than impressed at the time largely due to my brother watching it relentlessly and that it had somehow replaced my viewing of the daily cartoon shows. After maybe the 50th time of seeing said video I happened upon the Thing Fish album and that’s where it all changed for me, something clicked, I got it! I loved it! Twenty eight years later still listening, still loving, still discovering Frank Zappa, and even with an extensive, but by no means complete collection of 110 plus Zappa or Zappa related CDs, I find there’s always more to learn about one of the worlds seminal artists. For Zappa fans old or new, John Corcelli’s book offers us a good look at the life of a man who worked tirelessly to bring us his own brand of music, the exact way he wanted it heard. He reminds us of the creative force that is Zappa, this exceptional person who achieved so much in a relatively short time, Who toured, composed and recorded, all the while raising a family, making films, and the Zappa name famous the world over. He explores the early influences that went on to shape and inspire a career spanning more than 30 years. From childhood, his friendship with Captain Beefheart, the formation of The Mothers of Invention, his many and varied band members to his death in 1993 and the posthumous release of another 40 plus albums on top of the 62 he released during his lifetime, it’s all covered. 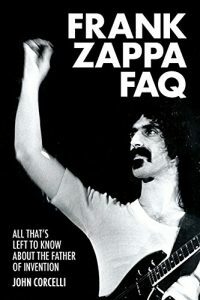 There is an exhausting amount of information about Zappa available from various sources and Corcelli has cleverly compiled it for us and put it neatly in the recognizable format of a book, if however you’re not quite sated and you wish to delve a little deeper into the Zappa universe, Corcelli has included a recommended reading list. For the new born Zappa fan he can point you in the right direction musically as well. After all when there are more than a hundred albums available where the hell does one start?